Material Study 01 (Sand) is a recording from a stereo hydrophone buried under the sand in a lake. Standing on top of the transducer, holding the MiniDisc recorder in my hand, and monitoring the feed with a pair of in-ear earphones, I slowly shifted my weight and the sand beneath my feet. My younger brother was on the shore throwing firecrackers into the water; this was an ‘accidental’ aspect of the recording. Material Study 02 (Cello and jacket) is made from a cello as it is dropped onto a carpeted floor with a contact microphone taped to it’s bridge. The moment of impact was ‘frozen’ with an infinite sustain effect pedal. Both the sustained tone and the live feed from the contact microphone were played into the room at high volume while the contact mic was still attached to the cello. This was recorded. Roughly one year later year later this ‘cello drop’ recording was amplitude modulated in a computer audio synthesis environment by a pair of stereo contact microphones taped to a wind breaker being blown by an air circulator as it hung from the ceiling by a string. Spatialisation Study 01 (One freeze from seven positions in a house) is made from four frozen tones generated from a file on my computer in a computer audio synthesis environment. The four tones were played back simultaneously in an arbitrary stereo spread at a high volume on a home entertainment system in the living room of a house with high ceilings. The stereo and computer were both left undisturbed for an afternoon, and their output was recorded to a portable SD card recorder via a matched pair of stereo omnidirectional condenser microphones mounted on a homemade disk baffle (for accurate stereo imaging) from seven positions within the house (order of presentation: 01 in the dining room, 02 on the second floor landing, 03 in the middle of the upstairs hallway, 04 in the middle of the upstairs hallway close to the floor, 05 in the front room close to the floor, 06 in the living room facing the speakers close to the floor, 07 in the living room facing away from the speakers close to the floor). Using a DAW, two minutes from each recorded position in the house were combined into the eight minute track here; identical overlapping envelopes were superimposed on each two minute segment, fading in for one minute and then fading out for one minute, with the subsequent segment beginning to rise in amplitude as the previous begins to fall. Spatialisation Study 02 (Forty-nine tracks of isolated and overlayed clicks generated from the material and positions of the previous study) is made from the convolution of randomly generated stereo ‘clicks’ with the seven two minute segments (mentioned above) in a computer audio synthesis environment. Each of these seven tracks were individually convolved and played back into the house. The output was recorded to a portable SD card recorder via a matched pair of stereo omnidirectional condenser microphones mounted on a homemade baffle disk (for accurate stereo imaging). A recording was made from each of the seven source tracks in each of the seven positions (mentioned above), for a total of forty-nine recordings. Using a DAW, one second was excerpted from each of the forty-nine tracks, playing one click from each source-position pair; all forty-nine tracks then play simultaneously. 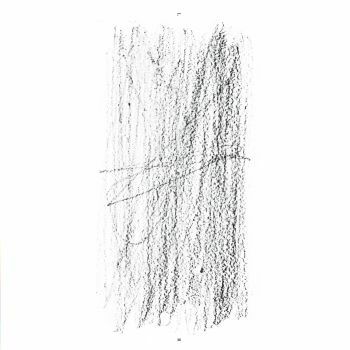 A pencil rubbing for the album cover is made from a pencil rubbing of the texture of a wall. A 7 ⅛” x 11” piece of rice paper was taped onto a wall with stereo contact microphones taped to the wall along the top and bottom edges of the paper. A pencil was slowly rubbed against the paper in vertical lines from top to bottom (or L to R according to the stereo configuration of the microphones) and recorded direct to computer. The rubbing produced from this process was scanned into the computer and can be seen on the cover of the album.